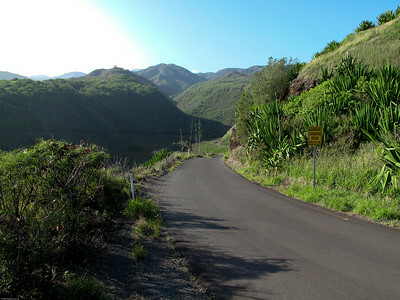 After working in Kahakuloa Valley, I continued on around the "mini backside" of Maui (the "mini backside" of Maui is behind the West Maui Mountains -- Kahakuloa. 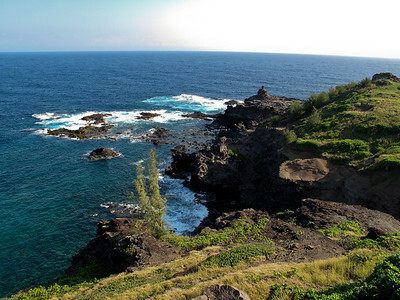 The "maxi backside" is behind Haleakala -- Kaupo). 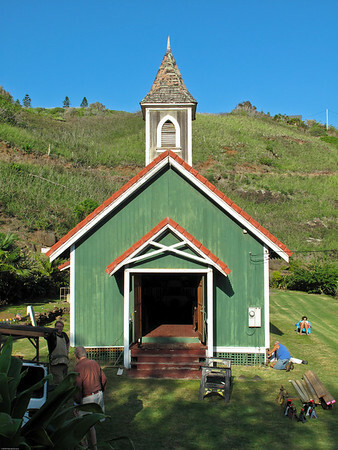 This often photographed church in Kahakuloa is receiving some repairs. 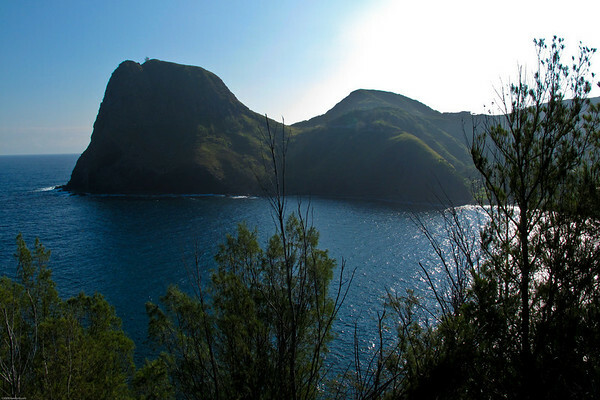 A challenge in photographing in Hawaii is the lighting goes from flat looking down sun to seemingly impossibly contrasty when looking into the sun. The sliders in Lightroom are put to the challenge but seem to hold up well as I believe this album will illustrate. 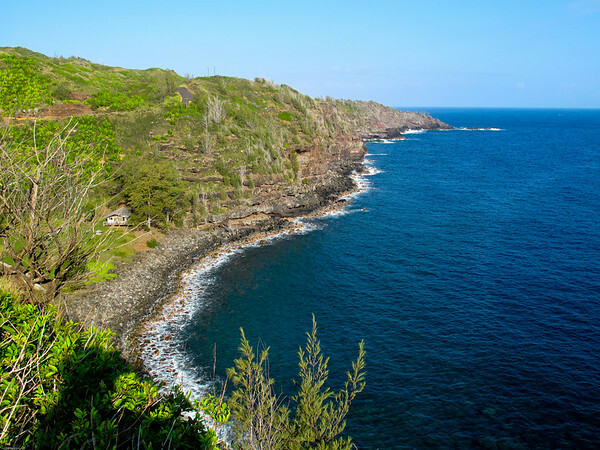 In addition to challenging the controls available in LightRoom, the harsh contrast is a big challenge to the camera and lens. Even though I had a brand new Canon D5 Mark II with me this entire album was shot with the Canon 10G. I figure I know what the 5D can do but I am still pushing the 10G to learn the limits of this "point and shoot" camera -- the Digic 4 processor is really good and I think its simple lens with few elements is the reason it handles backlighting so well. In this case there just wasn't enough detail in the dark area to justify lightening it so I left it dark. The digital zoom at a combined 20x (5x optical times 4x digital). 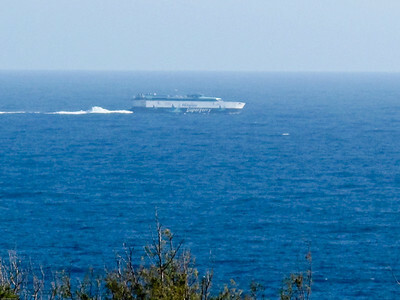 The superferry is very large but it was very far away -- in this case the digital zoom wasn't worth it. Also, it is very hard to aim using the LCD while the optical finder is completely inaccurate and I missed the boat completely at this magnification. In this case I would have been better off shooting the boat at 200mm with the 5D II. 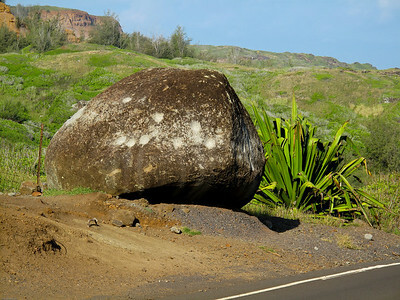 It is said if you strike this rock, you will hear a ringing sound. Maybe years ago (circa 1964 and 1971) that was true -- I heard it then but now I banged on all the white worn spots and heard no ringing at all. Perhaps all the depressions left from the banging over the years changed the resonance. The bright spot was really bright in the LCD but processed well holding some detail. 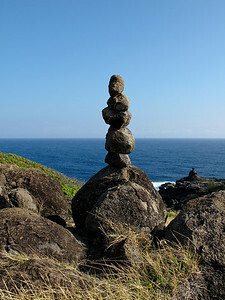 I'm not sure why but people seem to take pride in stacking four or five rocks all along the road around Kahakuloa side. 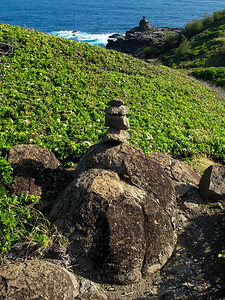 I don't know if the really large rock on the far horizon was balanced there by man or by wind and salt spray. Another example. The time of day, about 9:30am was a good time to photograph in this direction. 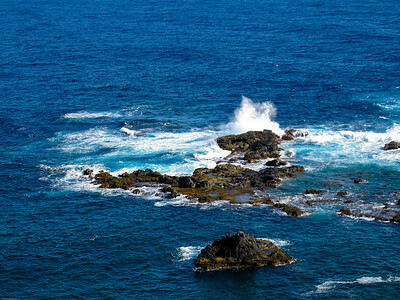 When shooting the water, be aware of the waves and take several frames to catch the best action from a visual point of view. 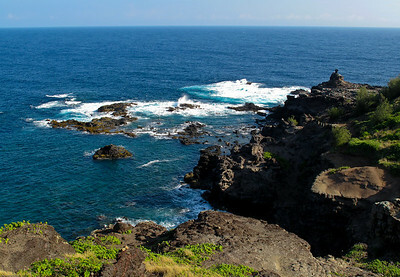 The spashing waves will add some action to the photo. 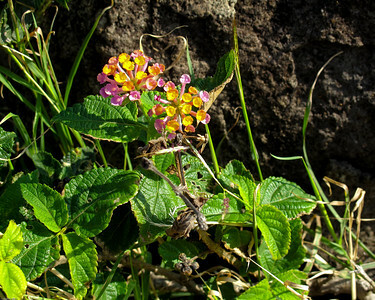 Lantana is a common flower in Hawaii. As a surveyor I hate it! It grows in thickets and has nasty thorns! Even as a flower it stinks! Literally as the smell is very bad. However, visually and as a tiny macro subject it is fine. 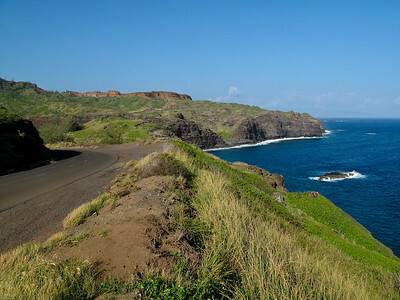 All along this road there are tempting views and many places to pull over and take them in -- unlike the Hana Highway where there is rarely a place to get over for photos.